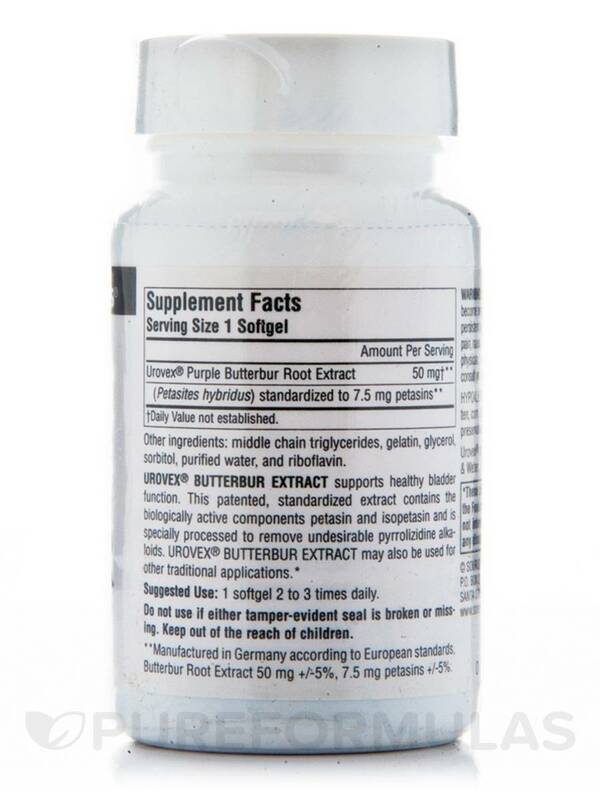 Urovex® Butterbur Extract supports healthy bladder function. This patented‚ standardized extract contains the biologically active components petasin and isopetasin and is specially processed to remove undesirable pyrrolizidine alkaloids. Urovex® Butterbur Extract may also be used for other traditional applications. Urovex® is a registered trademark licensed by Weber & Weber. Middle chain tryglycerides‚ gelatin‚ glycerol‚ sorbitol‚ purified water‚ and riboflavin. 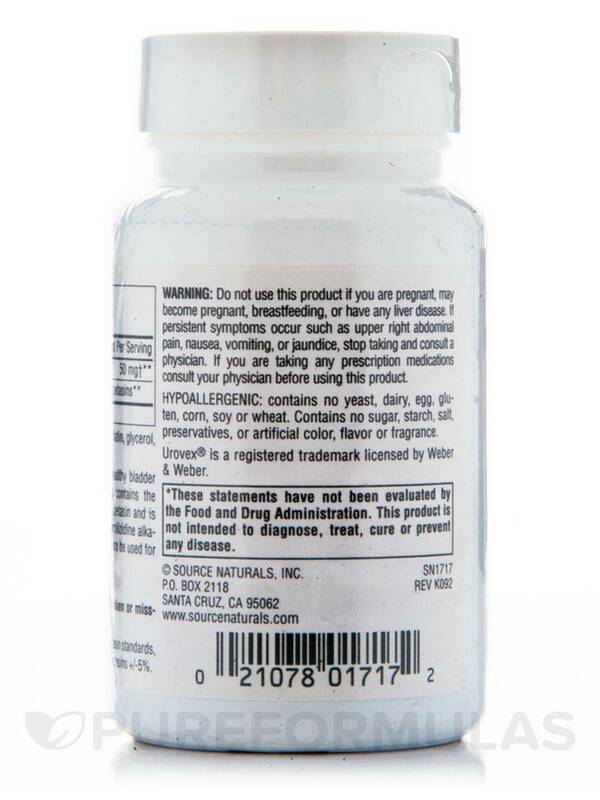 Do not use this product if you are pregnant‚ may become pregnant‚ breastfeeding‚ or have any liver disease. If persistent symptoms occur such as upper right abdominal pain‚ nausea‚ vomiting‚ or jaundice‚ stop taking and consult a physician. If you are taking any prescription medications‚ consult your physician before using this product.Do not use if either tamper-evident seal is broken or missing. Keep out of the reach of children. I love this product. Prior to using it I suffered with approximately 8 or 10 days of migraines each month. 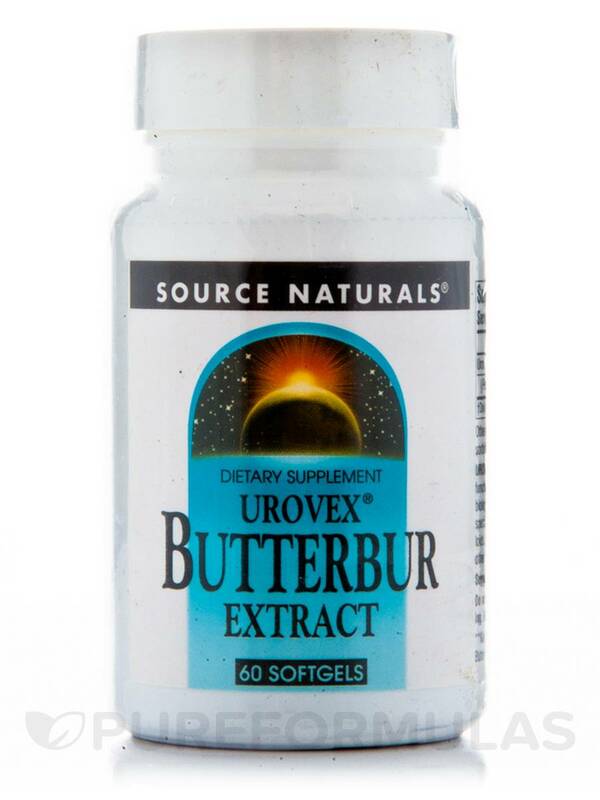 I have been using Butterburr (specifically the Urovex brand) for a couple of years and my headaches have been reduced to 2 or 3 days per month. I am using it in combination with 500mg of Magnesium so I am not sure which product is really helping the most but together they have changed my life! I cant praise Butterbur enough. I was having nasal/sinus seasonal allergies EVERY season and none of the OTC natural or prescription solutions did the trick. Finally I read somewhere about Butterbur and the suggestion to try it for about 3 weeks to get the full effect. I was patient and to my surprise It worked!! I started with 3 capsules per day and then decreased to 2 capsules per day for maintenance. I dont know about other brands but from my experience (I buy a LOT of supplements for our family) Source Naturals has good quality products and I figured their butterbur might be worth a little extra cost. I wasnt disappointed and have no desire to switch to a cheaper brand.